The haddock is a saltwater fish, found in the North Atlantic Ocean and associated seas. It is easily recognized by a black lateral line running along its white side and a distinctive dark blotch above the pectoral fin, often described as a “thumbprint” or even the “Devil’s thumbprint” or “St. Peter’s mark”. 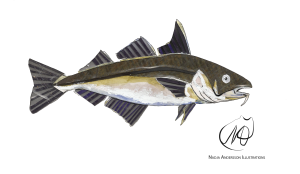 Haddock is most commonly found at depths of 40 to 133 m (131 to 436 ft), but has a range as deep as 300 m (980 ft). It thrives in temperatures of 2 to 10 °C (36 to 50 °F). Juveniles prefer shallower waters and larger adults deeper water. Generally, adult haddock do not engage in long migratory behavior as do the younger fish, but seasonal movements have been known to occur across all ages. Haddock feed primarily on small invertebrates, although larger members of the species may occasionally consume fish. Haddock range in size between 38 and 69 centimeters in length and 0.9 to 1.8 kilograms in weight. Growth rates of haddock have changed significantly over the past 30 to 40 years. Presently, growth is more rapid, with haddock reaching their adult size much earlier than previously noted. However, the degree to which these younger fish contribute to reproductive success of the population is unknown. Spawning occurs between January and June, peaking during late March and early April. The most important spawning grounds are in the waters off middle Norway, near southwest Iceland, and Georges Bank. An average-sized female produces approximately 850,000 eggs, and larger females are capable of producing up to 3 million eggs each year. The Barents Sea supports three main important commercial fisheries: cod, haddock and capelin. These species will be studied in the Barents sea case study.